Practicing Democracy forum Are we a country whose democracy is active, or are we at a point where our democracy is approaching a state of inaction? Facts and Opinions. Policies and Politics. It is strongly suggested ones opinions be based and coupled with facts. As Daniel Patrick Moynihan stated, “Everyone is entitled to their own opinions, they are not entitled to their own facts.” While compromise and consensus may be nice, it is neither required nor may it even be desirable for many questions facing our country. So please contribute and join the democratic action. To be free? Free from what? You are not free from eating. We all have to. We are not free from breathing. But we would like to enjoy it. To choose the air we breathe. We are not free from our bodies but we would like make the best out of it. Are we free from love? Most creatures have to love. But we would like to make a choice. Of who and how to love. Are we free from desires? I don’t think so. Even if we desire freedom it is still a desire. Even if we understand what freedom means. It is not. All living things strive to survive. Why? Why are we all trying to survive? Are we free to choose? To not survive? But if we choose freedom to make a choice to not live. Are we free after we die? We will not know. Is there freedom without us knowing, appreciating it? So we have freedom to make choices in matters that we do have choices. But is it complete freedom? Or are we trying to make the best choices in life because we don’t have freedom not to make choices? So what is life but a set of choices we have to make, even if it’s a choice to be free? It is all in our mind. You and only you can decide to be or not to be. You are free if you feel free. But we all have to make our choices. One Extreme does not Make Another Extreme good. Sometimes some of my friends counter my concerns about rising extremism from the right with the argument: "How about ultra liberals?" The extremists on the left? How about the BDS movement on university campuses? And these crazies with political correctness idiocy? And where is our freedom of speech? What I do not understand is the argument of “just look at the left! They are just as bad!" It is like blaming a kid for doing something stupid and the kid points to the other kid and says, "He is doing it too!” In the corner! Both of you! One bad does not make another good! So my short answer to my opponents is yes! They both are bad! We have to deal with extremism on both ends! But a clear and present danger today comes from the right. One extreme creates the other. Below is a quote on the subject. No, I do not accept political correctness and I do not support the hateful and unjust BDS movement! Any extreme is prone to trample on our constitutional freedoms – freedom of expression, a free and independent press, freedom of assembly, an independent judiciary. We all know examples of the extreme left coming to power: Soviet Union and Eastern Europe, Cuba, N. Korea and recently Venezuela. And the far right? Currently they scare me much more than the left...Nazis, KKK, Ult-right and other white supremacists. Their goal? Genocide! Extermination of all “inferior” races. Jews, blacks, brown and so on. Physical extermination! Of course today's statistic does not mean that we can ignore the far left extremism. We know that unopposed it leads to red terror. And by red I mean communism, not the GOP. Again here are reasons to be aware of danger from both sides! So the argument “how about them?” does not fly in my opinion. Who do we vote for? Who is better at fighting hate in America? And I am not talking about the current president who, in my opinion, has greatly contributed to this wave of hate, especially on the right. I am talking about our political parties now...Republicans and Democrats. As I stated before currently far right hate groups are far more dangerous than far left, especially considering the 2018 midterm results when Democratic Socialists did poorly. So although I consider myself an independent, today I am supporting Democrats, not Democratic Socialists - Democrats. And what are the root causes of these extremes? Now let's try to get to the root of the problem. Why is the country so polarized? Why this divide, this polarization, why is the extreme on both ends growing? There are several reasons in my opinion and according to research: Demographic reasons. White people are becoming a minority due to low birth rate and the majority of immigrants now are from Asia, Africa and Latin America. This trend in turn is tied to wars, climate change and the explosion of global migration as a result. Technology – automation, resulting in many jobs becoming obsolete and a portion of the population being squeezed out of the labor force, threatening their way if life. One robot at the automobile line substitutes six workers. Widening income disparity in America, but not only in America. Currently, the richest 1% hold about 38% of all privately held wealth in the United States. while the bottom 90% hold 73.2% of all debt. According to The New York Times, the richest 1 percent in the United States now own more wealth than the bottom 90 percent. Capitalism is losing it's popularity among young generations. Uncontrolled, unregulated capitalism leads to extremes, to unstable society and extreme governments – Venezuela, Nicaragua, Russia, Problems in Europe, or the election of populists like in Poland, Hungary, Brazil and yes, in the United States. The same people that are accusing Democrats of trying to install socialism in America by trying to control capitalism, reducing giant and increasing wealth gap between top 1% and the rest of population and improving social programs, in reality these people are contributing to social unrest and the rise of extremists on both sides – left and right. So what can and should be done to prevent major social upheaval in America? Education. There should be education about experiments with socialism, the history of countries like Soviet Union, North Korea, Cuba. History of what started WWII, why the Nazis came to power in Germany. What is a Democracy and what does it take to preserve a Democracy. The Constitution of the United States. The balance of power between the major parties. How checks and balances are supposed to preserve our rights, our democracy. It is very dangerous when one party controls all three branches of Government. America is a country of Law. The law enforcement agencies should not be politicized. Unfortunately president Trump is politicizing these institutions and undermining the reputation of these institutions. In conclusion, I want to stress the thought I started with: all extremes are bad, all extremes are symptoms of problems in our society, extremes cannot be ignored or excused. The worst extreme of today is Trump and his party in Congress. So please be informed, read, listen to, view different media outlets, learn. And please vote. It is our duty, our obligation to participate in our democracy. To preserve it for the next generations. Antisemitism and Trump “ Partisans asked: Isn’t Mr. Trump an ardent supporter of Israel who moved the US embassy to Jerusalem? Hasn't he condemned this heinous crime? Doesn’t he have Jewish grandchildren? All that is true. But Mr. Trump has also engaged in constant, vociferous attacks on minorities, immigrants and critics; he has given credence to fringe conspiracy theories and retweeted internet posts that are directly linked to antisemitic groups; he had to be dragged into disavowing the support of KKK leader David Duke; he tweeted an image of a Star of David over a pile of money; and he has described neo-Nazis who march chanting “Jews will not replace us” as “very fine people.” The Pittsburgh shooter, though critical of Trump for not having gone far enough, was clearly motivated by his attacks on immigrants. By Zarina Zabrisky with her permission. Zarina Zabrisky is a writer. www.zarinazabrisky.com. A Russian tank in Ohio. The hammer and sickle in front of the White House. The symbol of Russian imperial ambitions over the Statue of Liberty. 8,000 marching in Russian military uniform and carrying Soviet flags in 20 American cities. American daycare centers teaching history by the USSR textbook. The US Senators approve it. Reporting on May 5–9, 2018 events in the US: The demonstration of military might in combination with the soft power campaigns raises concerns about the Russian expanding aggression against the West. 6. A few suggestions on pushing back. 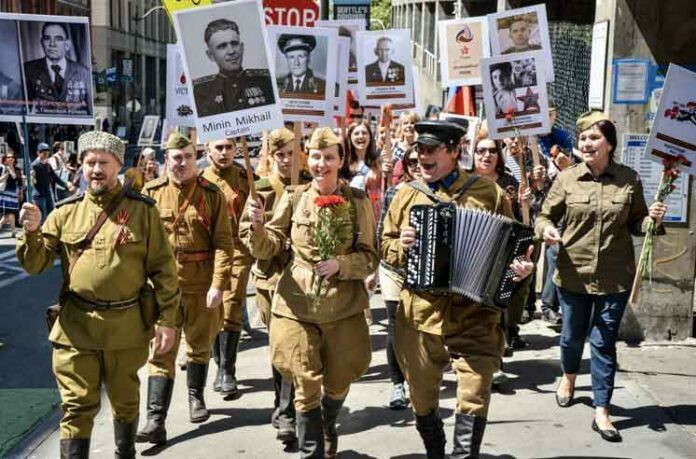 In 2018, about 8,000 people took part in the “Immortal Regiment” in twenty US cities, including New York, Los Angeles, San Francisco, Chicago, Washington, Miami. New cities joined the action this year: Kansas City, Birmingham, Houston, Vancouver and Phoenix. Americans dressed in Soviet uniforms. Over 700 people in Russian military uniform gather in front of the White House, with a Russian Ambassador to the United States in attendance. “Immortal Regiment” in front of the White House. A Russian tank T-34 takes part in the re-enactment of the Stalingrad battle in Ohio. Putin’s favorite broadcaster, the main anchor of the Russia Channel One, “the voice of Kremlin,” infamous for once threatening to reduce the US to the radioactive ashes, reports on the story. In 2018, the festival costs came up to 14,000 dollars of which 5,000 dollars was paid by the Russian consulate. In 2017, the FBI agents visited the offices of the Russian-American Initiative for Cooperation in Seattle.